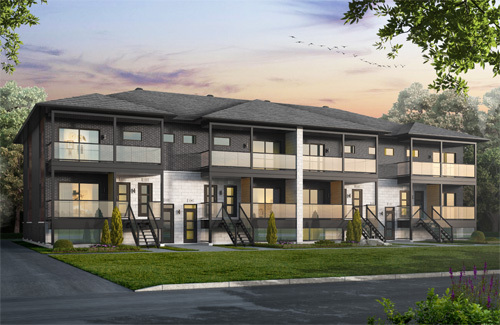 The Platinum Condos is a Devcore’s newest 12-unit condominium unit to be built in Embrun. Each unit consists of 2-bedrooms and 2 full washrooms, with in unit laundry and 1 exterior parking space. Finished with laminate floors, porcelain tiles and a modern open concept floor plan, separate living and dining areas are connected by the open concept kitchen. The master bedroom includes a large walk-in closet, and private 4-piece ensuite.This condo model is a popular choice for first time home buyers and downsizers alike, looking for a maintenance-free, well designed home. Our condo models have been designed for comfort and peace of mind. Second to none, we employ the most advanced methods of soundproofing between homes. Living in a Zinc condo model will provide you with quiet enjoyment and peace of mind that you would expect from a well-designed condo model.